Those that have risen are rising. And those that are fallen are staying down. A Norwegian owner of UK wind farms is one of several recent additions to the portfolio. Oil services company looks set to benefit from an improving oil market. Investors in iSelect have been on a turbulent journey. It is time to join the ride. It has been another year of positive returns for global equities markets. Fortunately, it hasn’t all been up. Unloved markets and unloved sectors are providing opportunities to put cash to work. Any year that’s positive is a good one. Any year you make 8% should be seen as a perfectly acceptable year in equity markets. The year 2018 was one, however, where Forager delivered decent returns but underperformed market benchmarks by a wide margin. Australia’s All Ordinaries Index returned 13.7% including dividends, versus 6.5% for the Forager Australian Shares Fund. The global MSCI benchmark returned 15.4% versus 8.8% for the Forager International Shares Fund. Read all of the details in our 2018 Annual Performance Report. It has been an extraordinarily good five-year period for both funds and equity markets in general. 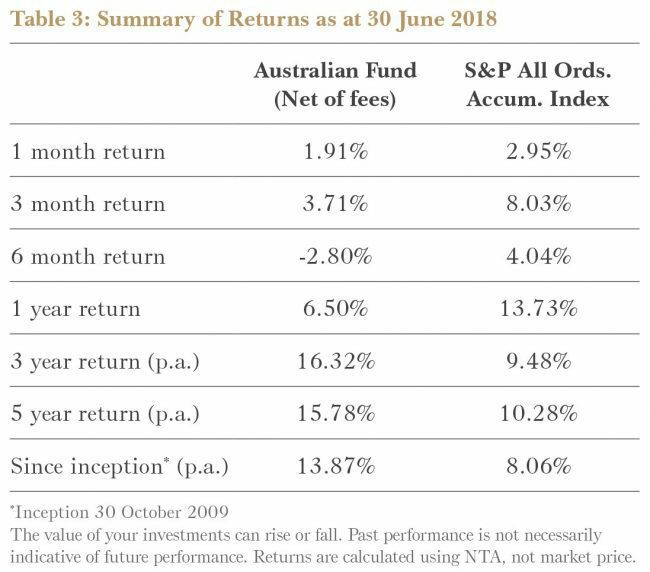 There hasn’t been a negative year of return in the International Fund’s history and the Australian Fund hasn’t posted a minus number since the 2010 financial year. Our promise from day one has been concentrated portfolios, periods of underperformance and lumpy returns. So this past year should not come as a shock and you should be prepared for years that are much worse, at least in absolute terms. That doesn’t mean we can’t learn anything. Firstly, the bloopers. Both funds had a standout loser: Technicolor in the International Fund and Thorn Group in the Australian Fund. Both share prices have more than halved and had significant impacts on the performance of their respective funds. Given the buoyant backdrop, you can safely assume that a halving of the share price means something has gone wrong. The question is whether the problems should have been foreseen and whether continuing to hold both stocks is the right move. We’ve spent a fair amount of time over the past year crunching the numbers on past performance and attempting to define any commonalities between the winners and losers. The first lesson was that many stocks that eventually performed well for us were originally purchased at much higher prices than our average purchase price. For a stock to get screamingly cheap it must first get cheap. Having the patience to wait for the former rather than making our money from “averaging down” would have added considerably to returns. We thought both Technicolor and Thorn were cheap at the time of purchase, but we could have waited longer. It was a lesson well applied to iSelect (see page 11). The second lesson was that the big money — those stocks on which we made multiples of our initial investment — were ones where the businesses turned out to be at least decent. One of our key competitive advantages is the willingness to bear pain and buy stocks or invest in sectors that everyone else hates. We have actually made money out of businesses like ASX-listed Boom Logistics that are likely to earn sub-par returns on capital over the cycle. The money was made from buying it at a massive discount to its asset backing. But those positives have been partially offset by poor businesses that keep deteriorating. Some of them have cost us our entire investment. Contrast that with stocks that were perceived as terrible businesses at the time we purchased them, but where that perception came full circle. If a business recovers and other investors apply higher multiples to much higher earnings, the returns are compoundingly good. That was the case with Service Stream, which we sold the last of in May after seeing it appreciate more than 10 times from trough to peak. And it was a consistent theme among our biggest winners, from Jumbo Interactive in the Australian Fund to Lotto24, El.En and B&C Speakers in the International Fund. There are solid grounds for hope for both Technicolor and Thorn on that basis. Both have good businesses at their core and we think they could both be viewed in a very different light if they can shed some of their baggage. 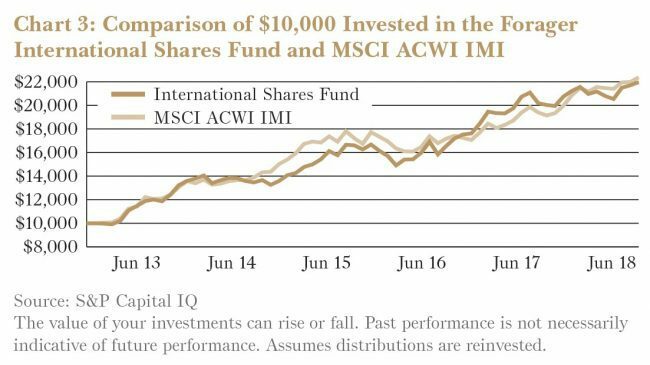 The other internal factor that has caused performance to lag is a large average cash weighting in both funds. That is a choice, of course, not a necessity. But it is also a natural consequence of the massive performance year for both funds in the 2016/17 financial year. When performance is particularly strong, stocks that are no longer cheap need to be replaced with new ideas. In a perfect world, we would get a market contraction while putting all of the cash to work, but if markets run higher, as they have, the cash weightings are going to weigh on performance. Globally, cheap stocks in the UK have allowed us to put a good chunk of the excess cash to work. In Australia, you should still be crossing your fingers for lower stock prices. We still have more old ideas reaching maturity than we have new ideas meeting our required rates of return. Finally, the 2018 financial year was a difficult one for value investors in general. Cheap stocks, defined as those trading on low earnings multiples and at low multiples of their book value, have underperformed so-called growth stocks for a number of years now. In the past 12 months, the difference has been stark. IF A BUSINESS RECOVERS AND OTHER INVESTORS APPLY HIGHER MULTIPLES TO MUCH HIGHER EARNINGS, THE RETURNS ARE COMPOUNDINGLY GOOD. In short, the hot stocks have gotten hotter and the unloved sectors have remained unloved. 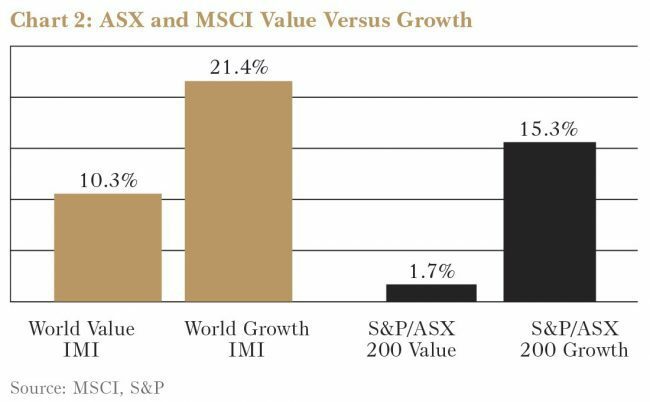 Europe and the UK dramatically underperformed the US and an S&P measure of value on the ASX underperformed “growth” by 13.6 percentage points. Forager has flexible mandates and there is nothing forcing us to own stocks that are superficially cheap. We don’t pursue value investing as a religion. We pursue it because there is an inherent logic to buying businesses that are going to generate high returns on the capital invested over a long period of time. There is nothing in that equation that says a business needs to trade on a low price to book ratio or low price to earnings ratio. In fact, our most successful investments have not featured either of those attributes. Service Stream was loss-making at the time we bought it and hardly has any tangible assets. Lotto24 made its maiden profit in 2017 and today trades at 140 times historical earnings. Sometimes assets and earnings are a good guide to the future. Other times they are not. The key is to be able to predict a potential stream of cashflows with some degree of accuracy and buy that stream at a price that gives you an adequate return and a margin of safety. Investors in many of the momentum stocks that have performed well in recent years are ignoring both facets of that equation. They are paying enormous prices for businesses where the pathway to profitability is at best difficult to define. And, even where future profitability can be discerned with some confidence, they are accepting prospective returns that will only seem attractive if interest rates stay at current low levels forever. As long as prices keep going up, don’t expect too much rationality to be applied. “It might seem strange to complain after the year that was, but we hate markets that ascend smoothly and consistently. We much prefer yin and yang over time, and look forward to a bit more pessimism in future.” – Forger 2017 Performance Report. Today, relative to the US, European stocks are trading at the lowest valuations in more than a decade. We have deployed a significant amount of cash in the International Fund and have a particularly prospective list of opportunities. Even in the Forager Australian Shares Fund, where we are still cashing in a number of mature investments, several new names have recently made their way into the portfolio. As long as most of the market remains focused on momentum, there will be plenty more to come. Don’t forget the Forager annual roadshow in late July and August. I’m not having you on, seats are limited and going fast (dates and venues below). And if you can’t make it in person, there is a webinar version that allows you to participate live, via your PC, or to watch at a later date at your leisure. We have some great content lined up, including a more detailed review of what has worked and what hasn’t. Senior analyst Gareth Brown is giving a presentation on how we find ideas and, more importantly, what we look for when trying to find them. Following on from our review of the past eight years of stock picking, we’ve spent time identifying exactly what our competitive advantage is and why a small team of us based in Sydney can generate outsized returns around the world. Gareth is going to explain the conclusions we have drawn and how those conclusions have been developed into a template we can replicate. The insights are essential for anyone trying to run their own money or identify a manager to do it for them. I hope to see you there. The second half of the 2018 financial year has been productive. Several significant new investments have made their way into the portfolio and a few old investments have been re-balanced. Europe and the UK are providing welcome respite from expensive global equity markets. 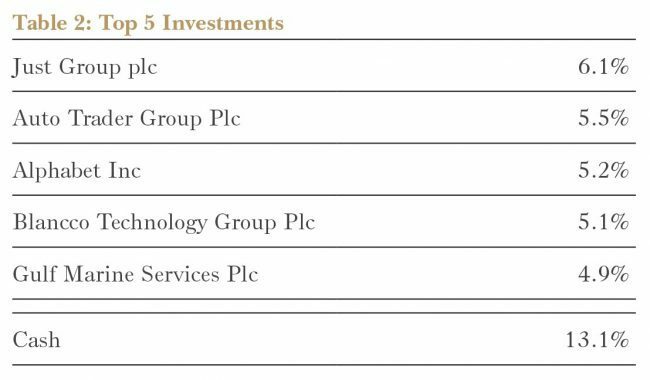 As you can see in Table 2 on page 9, four of the Forager International Shares Fund’s top five investments are listed in the UK. The portfolio’s cash weighting is down to 13%, less than half its levels a year ago. While the UK exposure might seem like undue concentration, it is a well diversified portfolio of stocks that happen to be listed in London. Among them are an oil services company headquartered in the United Arab Emirates and a Greek property owner. And then there’s a company that is listed in Norway but has most of its assets in the UK. If you are confused, don’t be. Finding “orphan” stocks that aren’t well understood by local investors is one area we can have an investing edge. Bonheur ASA (OB:BON) is a 120 year-old Norwegian conglomerate controlled by the Olsen family. Its roots are in shipping and offshore drilling. But onshore wind farms in the UK and Scandinavia, where the company has been a pioneer, are more important to the valuation today. Until recently Bonheur’s divisional disclosure was opaque, leaving out information necessary to value the company. Bonheur changed the way it reports and the Fund bought soon after. The market took a while to cotton on to the new information. Cash is the bedrock of this sum-of-the-parts. There was more than NOK900m at the parent level at 31 March 2018. Subsequent to that date, the company sold a 49% stake in two new Scottish wind farms Bonheur developed, Brockloch Rig and Crystal Rig III, to Aviva Partners. The two farms have a combined capacity of 75 megawatts (MW). We estimate the sale will put an additional NOK1.1bn into Bonheur’s bank account, after tax. So call it NOK2.0bn cash at the parent level. For perspective, that’s more than 40% of Bonheur’s market capitalisation of NOK4.7bn. 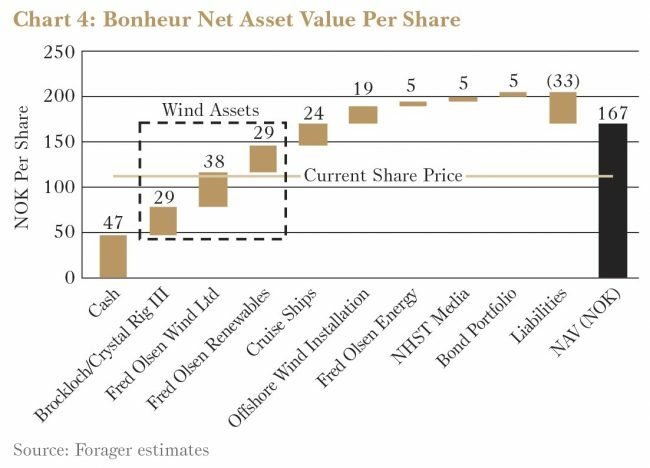 See the below chart outlining our estimation of Bonheur’s net asset value per share. The Aviva deal provided cash. More importantly, it provided evidence for our underlying investment thesis — that the market was dramatically undervaluing this company’s wind farms. Bonheur still owns a 51% stake in those two wind farms. The valuations in the above chart assume a price per megawatt of capacity of £2.0-3.0m, less than the £3.17m per MW at which the Aviva deal was struck. GULF MARINE’S MAINTENANCE SERVICES SHOULD BE IN STRONG DEMAND FROM CUSTOMERS WHO WANT TO CONTINUE TO OPERATE SAFELY AND EFFICIENTLY. There are two other wind related assets. Fred Olsen Wind Partners (FOWL) is a Bonheur subsidiary which has developed six wind farms in Scotland over the past 15 years. They have a combined capacity of 433 MW. Prior to 2017, the UK had a generous incentive scheme for developers of renewable energy sources. While that regime has changed, all wind farms created prior collect significant additional revenue from subsidies for a period of 20 years from completion. Within that regime, an older wind farm is worth less than a newer one, not the least because the newer farm will collect subsidies further into the future. The wind farms owned by FOWL were completed between 2003 and 2012, and aren’t as valuable per MW of capacity as Brockloch Rig and Crystal Rig III. In 2015 Bonheur sold a 49% stake in FOWL to infrastructure investor Renewables Infrastructure Group (LSE:TRIG). The implied price was £1.74m per MW of capacity. The assets are three years closer to retirement and the loss of subsidy revenues than they were in 2015. So we’ve been conservative, valuing the stake at NOK1.0-1.6bn, or between 40% and 60% of the value implied by the TRIG transaction. These assets are throwing off a lot of cash today and will continue to do so for years yet. There’s significant potential upside to this valuation. The final operating wind asset is Fred Olsen Renewables, a 100%-owned subsidiary which owns 149 MW of wind farm capacity in Sweden and Norway, a large pipeline of potential wind farm development sites in the UK, Ireland and Scandinavia and, importantly, more than NOK500m in net cash. With a less generous subsidy environment, these assets don’t generate a lot of free cash at today’s electricity prices. We’ve valued them well below construction cost, leaving room for pleasant surprises. Our valuation range is NOK800m-1.25bn for the division (including cash). We are already up to more than the current share price in cash and reliable infrastructure assets. There are other bits and pieces that add up to significant amounts of money. Bonheur owns four old-dame cruise ships plying the waters of the Atlantic and Mediterranean. It has an offshore wind installation segment, which owns two giant jack-up vessels used to help customers install and maintain offshore wind turbines. There’s a 52% stake in listed driller Fred Olsen Energy (OB:FOE). It is heavily indebted (non-recourse to Bonheur) and probably worthless. Our upside valuation is dictated by the current share price (which is down 97% since 2014). Add Bonheur’s bond portfolio and its stake in NHST Media which, among other things, owns Norway’s largest business newspaper and has a chunk of net cash on its own balance sheet. Deduct liabilities — chiefly parent-level unfunded pension obligations and capitalised corporate costs, as the company is externally managed — and you get a valuation of more than NOK160 per share. The Fund purchased its stake in Bonheur shares last August when the new disclosure regime was fresh and the Brockloch Rig wind farm was still under construction. The average purchase price was NOK82. At NOK110 per share today, the stock is up over 30% since. But it’s still cheap. Our most conservative valuation suggests very limited downside from today’s share price. More likely, the stock is worth significantly more than it’s trading at today. The base case valuation in Chart 4 is far from a best case scenario. Over the years both funds have successfully invested in many ‘asset plays’ — companies trading at big discounts to their net asset backing. But, provided their businesses recovered, a reduction of the discount has usually been only part of the upside. Most of the returns have often resulted from investors shifting their attention to the improving earnings, boosting their share prices higher. Oil and gas service provider Gulf Marine Services (LSE:GMS), one of the International Fund’s newer investments, trades at a huge 60% discount to its net tangible asset backing of US$400m. While that is a larger discount than most other ‘asset plays’ available in this battered industry, we think it’s one that has the potential to eventually be perceived in a different light. FOR THE RECORD, WE’RE NOT BEARISH ON ROLLS. RATHER, WE’VE JUST LOST CONFIDENCE IN OUR FORMER BULLISHNESS. Gulf Marine historically, operated a fleet of specialised vessels in the shallow waters of the Persian Gulf. Its vessels have long steel ‘legs’ that lower to the bottom of the sea allowing the deck to jack up and provide a stable platform from which to provide crane and accommodation services to oil projects. Importantly, these vessels are self-propelling and so can reposition faster than most of the competing ones which often need towing around at extra cost to the client. Historically Gulf Marine’s customised vessels and close relationships with the National Oil Companies of the Middle East, particularly Abu Dhabi’s ADNOC, allowed it to earn a 20% return on capital. But the oil price’s stunning decline over the past few years, from above US$100 per barrel to below US$50, lead ADNOC to terminate several contracts early. This has also pushed a wave of vessels which would not normally compete with Gulf Marine into the region and caused daily hire rates to halve. 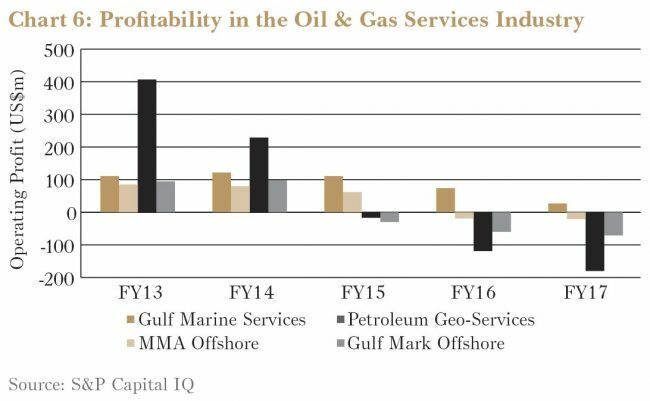 Gulf Marine’s sales fell from US$220m in 2015 to only US$113m in 2017, and operating income of more than US$110m per year fell to US$27m over the same period. Those lost earnings make the company’s net debt of US$370m look daunting. The debt is not due until 2023, however, and Gulf Marine’s ability to repay it looks set to increase meaningfully. Firstly, Gulf Marine’s maintenance services should be in strong demand from customers who want to continue to operate safely and efficiently. ADNOC production is now around 3m barrels per day against a stated goal of 3.5m and it is one of the few OPEC participants capable of increasing production. So new work should soon come for tender. Secondly, the company has recently completed a fleet expansion program, meaning it now has a larger number of modern vessels available and no significant investment cash outflows. Three of its largest and newest vessels have been redeployed in Europe building wind farms. Day rates are unlikely to rise much in the short term, but an increase in vessel utilisation should prove enough to service the debt comfortably and justify paying close to book value for the company. Importantly, though, the oil market is already showing signs of recovering. If this continues, non-specialised vessels will likely exit Gulf Marine’s market to return to their intended uses. This could cause day rates to spike up drastically, improving the business’s profitability. Under this scenario the investment has the potential to more than triple. 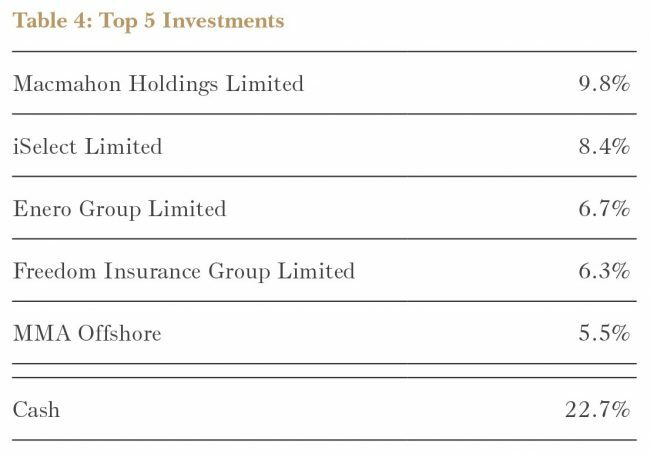 Gulf Marine is now close to 5% of the Fund’s assets. We were recently reading a “Links of the Week” post from a European investment blogger. The email focused on a divergence of opinion on aircraft engine manufacturer Rolls Royce (LSE:RR), linking to several fund manager letters with bullish and bearish opinions. Sure enough, there in the bearish segment was a link to our April Monthly Report. For the record, we’re not bearish on Rolls. Rather, we’ve just lost confidence in our former bullishness. A little too often we found ourselves wondering whether we had an edge in the stock. For us, that is time to get out. The case for Rolls revolves around the several XWB engine offerings for use on the blockbuster Airbus A350. It is the exclusive engine option on that plane and it’s a very big opportunity. The group sells engines at a loss and recoups those losses and much more over decades of providing very profitable aftermarket parts and services. Typical airlines pay a certain amount for every hour of flying time, and Rolls provides the parts and service. Having a very large order book for future engine sales and aftermarket services is half the battle, and Rolls is very well placed in that regard. But success is not assured. As an engine programme matures, there are risks and opportunities. The opportunities typically revolve around the ‘cost curve’ — developing knowledge and technology so that each successive original equipment sale generates lower losses as a particular engine programme matures, even making it to breakeven. It follows a similar journey trying to maximise the profit of parts and services components. The risks revolve around unexpected additional costs. We’ve seen that recently with Rolls’ Trent 900 and 1000 programmes, where various engine parts aren’t operating to specification. It is incumbent on Rolls to fix the problem with each engine — at a very significant cost. That is a reminder that a big order book is both a big opportunity and a potential millstone. 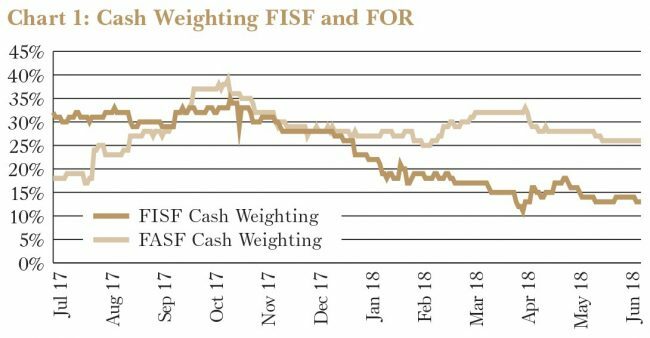 Since the Fund sold its position, Rolls has released a fairly aggressive new free cash flow target. If it hits that target, there’s plenty of money to be made from here. But it’s also revealed yet another cost blowout on the repair job for the Trent 900 and 1000 engines. We were going to write a longer postmortem of what has proved a mildly profitable investment. But it seems kind of pointless. This is a portfolio of the very best ideas we can find around the world. We’ve been finding quite a few of them. Rolls Royce no longer makes the grade. In Italy a coalition between the anti-establishment Five Star Movement and the far-right Northern League parties has formed government. Their aversion to spending cuts and scepticism towards the European Union worries the market. Local bank shares, such as Fund-holding UBI Banca (BIT:UBI), fell circa 30%. We think that, unless the political system changes, the likelihood that this new government will be able to enact extreme reforms — such as going back to the Lira — is low. Cement-maker Cementir (BIT:CEM) finalised the purchase of an additional 39% stake in Lehigh White Cement, a US-white cement manufacturer. The cost of US$107m implies a multiple of 10 times operating earnings. Cementir now owns 63% of the company while Mexican company Cemex (BMV:CEMEX) owns the rest. Cementir’s Turkish business is improving but further depreciation of the local currency will likely result in its earnings remaining flat this year. Nevertheless the stock remains attractive, trading at a forecast price to earnings ratio of about 11. Real estate agent Hopefluent (SEHK:733) is in the process of merging its primary and secondary real estate agency businesses with those of Poly (SHSE:600048). The combined entity will be the largest agency in China with a market share of roughly 5%. Hopefluent will own 56% of it. While the Chinese primary market will likely slow down, the secondary market should continue to grow for many years. Despite the positive news, the investment will remain a small one for the Fund. UK auto classifieds website Auto Trader’s (LSE:AUTO) results for the year ended 31 March 2018 confirmed the thesis set out in the March 2018 Quarterly Report. Revenue rose 6% to £330m, higher again if you adjust for the quirk of the prior year being 4 days longer. Profit after tax increased 11% to £173m. While the UK used vehicle market is soft, the company should prove resilient. On the first day of the current fiscal year, listing prices rose modestly and the company also began charging dealers for a popular new option that allows users to search vehicles via monthly prices. There’s more growth ahead. It has been a year of transition for the Forager Australian Shares Fund. iSelect and Thorn Group are two new opportunities making their way into the portfolio. Earnings guidance slashed by 64%. CEO gone. The stock down 54%. That was the situation for iSelect (ISU) when we started buying the stock in April. And this isn’t their first time disappointing investors. That sounds horrible, so why does the Australian Fund now own 9% of the company? First, a little about the business. iSelect is a website for comparing products. Health insurance is the most popular and generates half of the company’s revenue. Users can also compare electricity, broadband internet offerings and life insurance. An online enquiry is usually followed by a phone call from an iSelect salesperson (sometimes a few too many). About 90% of purchases involve talking to one of iSelect’s representatives. While iSelect doesn’t compare all health insurers (Medibank and BUPA mostly stay off the site), there is a big range of policies to choose from. The consumer gets a better deal and iSelect gets paid to refer clients to providers. It seems simple. Unfortunately it isn’t quite that easy. Since listing the business has disappointed in nearly every year. A missed prospectus forecast led to an ASIC probe in 2013. Expected future cash flows were written down in 2014. Financial year 2015 saw the failure of a health insurer to which iSelect lent money and there was another major downgrade in 2016. The business is now onto its fourth CEO in five years. And that’s not where the problems end. Attracting consumers to the site is costly. And it’s getting costlier. A third of iSelect’s revenue went into marketing last year and about half of that was spent on paid search engine marketing with Google. With competing comparison sites and the health funds themselves spending to attract clients, the best words have been costing 15% more each year. As a result, iSelect has been spending more offline this year. But while a $10m TV campaign can generate $20m or more of revenue, it can also be a complete flop. And that’s what happened to trigger iSelect’s current downgrade woes. Yet there are a few valuable assets and a viable future business in the mess. Start with the assets. Some insurers pay iSelect upfront for referring a client. Others pay each month while the client remains with the insurer. This means the business is collecting cash on work it did years ago. This cash flow stream, paired with some cash and a small investment in a similar business offshore, is worth about $0.58 per share. 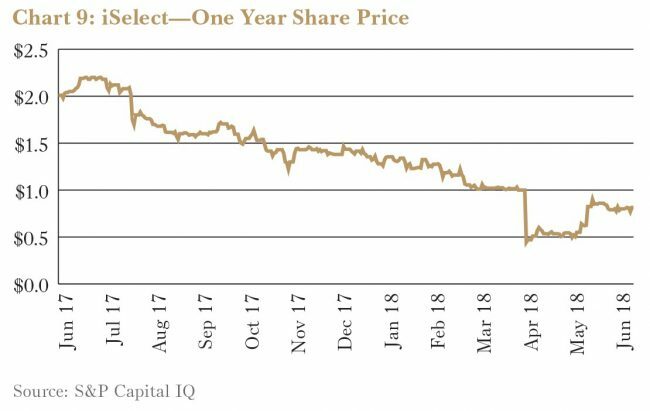 AFTER PANICKED SELLING IN APRIL, ISELECT WAS TRADING AT A DISCOUNT TO ITS BALANCE SHEET ASSETS, WITH NO VALUE APPLIED TO THE FUTURE. While iSelect’s earnings have been unstable, the business has averaged $10m in net profit per year excluding the historical payments. It still has high market share in new health insurance policies, brand recognition and a place in the marketing budgets of health insurers. That was more than enough to get us interested. Then things really heated up. The owner of Compare the Market (think meerkats), the largest domestic competitor, took advantage of the downgrade to acquire 20% of iSelect. It has been a fierce rival in the last few years and is funded by a UK group which recently took in £675 million in funding. The combination of the two businesses would make a lot of sense. Duplicated costs could be removed. Marketing budgets could be trimmed. And the combined group would be a key distribution channel for private health insurers. With all these benefits, Compare the Market will have to pay up if they want to take full ownership of iSelect. In the meantime iSelect will be tidying up its marketing spend and working on selling more products more effectively. A little improvement can go a long way on this one. It has been fascinating watching investors get excited and then depressed about the same business over the past few years. It is also extraordinary how far a few bullish company announcements can drive a stock price up — especially in a bull market like this one. We’ve heard our fair share of promises from company management teams over the years. iSelect told investors that earnings before interest and tax would be $26m to $29m for the year. A little over two months later expectations were slashed by over 60%. How much weighting should management guidance be given in investment decisions? And what happens when it clashes with other sources of information? 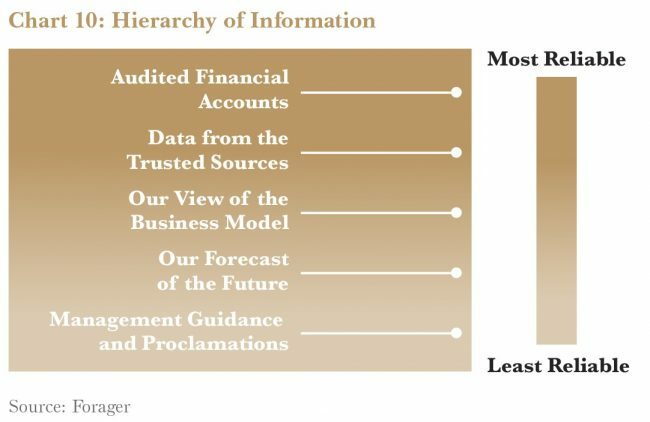 Management has access to information that outside investors don’t. Shouldn’t their guidance be better than anybody else’s? Unfortunately, it is not that difficult to punch a few optimistic sentiments into Microsoft Word and lodge it with the ASX. We lodge the NTA for FOR on the ASX every day — all it requires is a few short clicks of the mouse. And the information that management sees is usually processed in a cloud of optimism. Incentives encourage positive, not realistic, guidance. Have a good story to tell? Tell it early and often. Things going badly? Hold back until you know it’s not going to turn around. It goes beyond guidance for the current year. Plenty of companies will tell investors that they have “no competitors”. Really? A small company from Australia has this global market all to itself? Or, like Smart Parking (SPZ), they lay out a presentation slide that suggests 300% annual returns on capital. Extraordinary claims require extraordinary proof, and management claims alone won’t do. Especially in smaller stocks, where promotional management teams run rampant, trusting what senior executives say can be difficult. Often it will be dependent on who is doing the talking, and how they have behaved in the past. Next along the quality of information spectrum is us. First, our hypothesis of what the world is going to look like in the future. Personal experience might suggest that newspapers are dead. NZME’s (NZM) profitable print business suggests otherwise. And there are plenty of steps between going into your busy local Lovisa (LOV) and buying the stock. Our views of the world’s future have their own biases. It doesn’t mean you don’t think about how the world might change. It just means you shouldn’t overweight your own subjective opinion. A little more sustainable is our view on what a good or bad business looks like. Should a competitive mining services business be earning high returns on capital? It is possible, but that deserves a lot of scrutiny. And it might be very short lived. Those more likely to earn high returns on capital are businesses that have an identifiable competitive edge. Think CSL (CSL) or REA Group (REA). Then there is the information that comes from trusted sources. Conclusions from Australian Bureau of Statistics (ABS) data, for example. Or historical industry growth rates. And the big one: audited financial information. Of course there are issues. We are constantly on the lookout for earnings manipulation and other accounting red flags. But there is likely to be more truth here than in management proclamations about the future. And time matters. A few years of audited financials is good. Five or ten is better. There has been more time to see structural changes in the business, more time for instabilities in the business model to show themselves, and more time for management to prove themselves sound capital allocators. When the latter points come into conflict with the former it is the latter that usually win. If management imply returns on equity that clash with a rational assessment of the business model, the business model view is likely to win out. If our view of the business model clashes with years of audited accounts, we are probably going to change our mind. With so much information on stocks it can be hard to prioritise, but weighting new information equally is not the answer. Preferencing more accurate sources will flow through to more accurate decision making. Which brings us to a stock where the consensus view of the future is bleak, but the audited accounts tell us there might be more to the story. Thorn Group (TGA) has been giving the Australian Fund trouble over the past year. It is the Fund’s number one loser, costing us 2.6% in absolute performance. Earnings downgrades. Tick. Debt issues. Tick. An ASIC investigation and class action. Tick and tick. The stock is down 80% over three years and is 60% lower over the past year. Our expectations have changed but we haven’t given up. In fact, the Australian Fund has been buying more shares. Things have changed quickly for Thorn’s Radio Rentals business. Leasing out TVs and washing machines to cashstrapped consumers was a profitable business for years: the 10 years to 2017 saw return on capital average more than 20%. 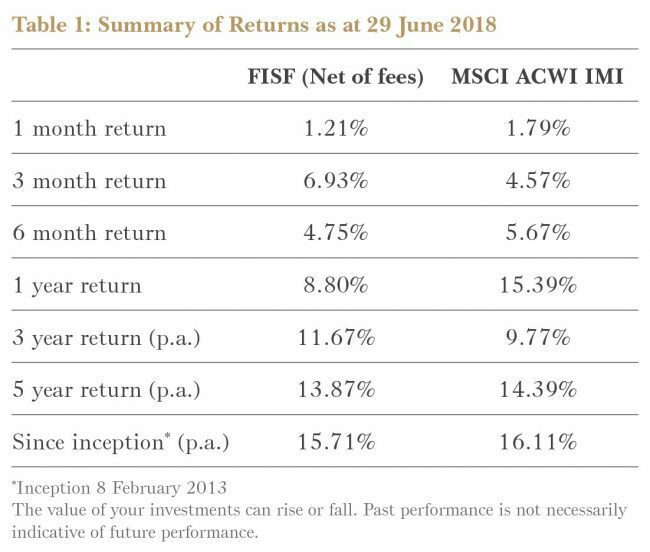 In the most recent year to 31 March, return on capital was just 6%. Plenty has gone wrong. First, ASIC clamped down on Thorn’s assessment of its customer’s ability to pay; big banks have had similar home loan issues highlighted by the Royal Commission recently. Pressure from this and proposed legislation then forced the business to tighten up leasing criteria (approving less clients for products) and reduce prices. The CEO departed in April 2017. The number of goods the business sold last year fell by a third, sparking a breach of corporate debt covenants. The class action specialists at Maurice Blackburn then sprung into action, claiming $50m for past customers. Costs are up from having to deal with all the regulatory and legal issues. 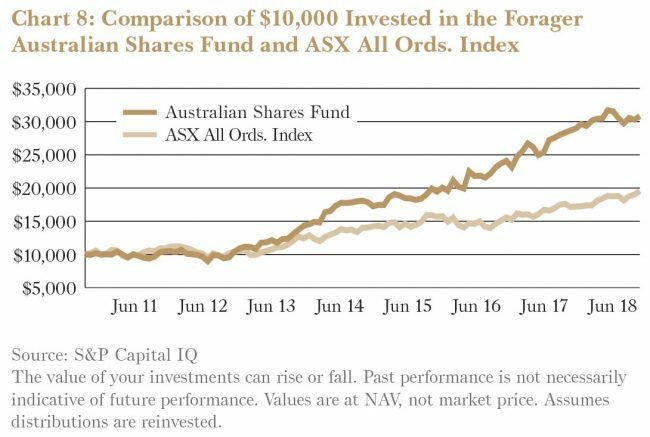 It might sound like a common question this quarterly report, but why has the Australian Fund been buying more stock? Well, we are looking forwards, not backwards. Thorn settled with ASIC earlier this year and paid back the money owed from past misdeeds. Systems are now in place to ensure compliance. Debt issues seem to be under control. 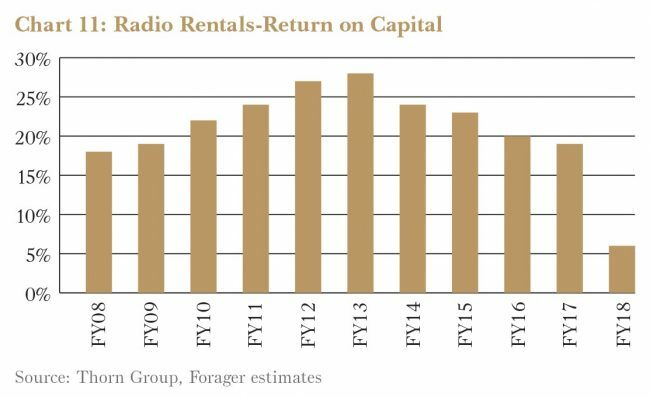 And Radio Rentals is still to collect $155m worth of future lease payments from past sales. A new CEO, with experience in retail, came on board in February. He has plans to broaden the product range, cut some costs and make transactions easier. We are not suggesting the business goes back to making 20% return on capital. Those days are over. With brand recognition, a strong market position and loyal customers Radio Rentals does have a place in the world. A return on equity of 10% seems reasonable over time. That’s not it though. When times were good Thorn took the cash from Radio Rentals and invested it into less attractive businesses. Most have been sold over the last two years: past-due collections, consumer lending and invoice funding businesses. But one has, so far, worked out well: an equipment finance business that funds gear for small and medium enterprises. Think cars and fitness equipment. Equipment finance has been growing quickly, with earnings before interest and tax up 50% last year. As it should be. Thorn borrowed more money from its funders and lent it, mostly through brokers and other partners, to customers. When compared to the amount of capital at work here, returns are only 9%. That’s fine for now. But it won’t be when loan defaults rise from their current low levels. A short operating history means lending quality is still to be tested. And while being able to borrow 80% from funders seems like a good idea now, it will compound the problem when issues arise. It’s time to sell this business too. Thorn has net tangible assets (mostly cash still to be received from customers) of about $200m. This is double the current market capitalisation. It’s not going to be an easy path, but with a margin of safety, and plenty of upside if things go well, we are still adding to our investment. Specialist life insurance company Freedom Insurance (FIG) announced a rebound in sales in April along with a significant acquisition. Sales are now forecast at $63m for the year, suggesting that the downturn in late 2017 may have been temporary. The acquisition of St Andrew’s Insurance from Bank of Queensland (BOQ) gives Freedom more control over the design and manufacturing of its insurance products. The price seemed attractive. Freedom paid for the capital in the business and future expected profits from policies already sold, without a premium for the brand and future sales. 3P Learning (3PL), a provider of education software, sold its stake in another software business, Learnosity. This stake was bought by the prior CEO two and a half years ago for $49m and sold for only $25m. It’s a disappointing outcome. But with the disposal out of the way management’s time should be freed up to continue growing 3PL’s math business domestically and internationally. MMA Offshore (MRM) announced the award of a three year contract for the MMA Pinnacle, one of its larger oil and gas services vessels, to i-Tech Services, a provider of inspection and maintenance services. While oil prices have recovered substantially over the last year and a half, work for offshore vessel owners like MMA has been slow to materialise. Contracts like this show that work may now be coming through. Putting vessels to work is step one. Next, daily rates need to increase to give vessel owners a fair return on their capital. Logistics provider CTI Logistics (CLX) acquired Western Australian regional freight carrier Stirling Freight Express for $4.5m in May. The acquisition will be completed in July and funded with debt. Stirling’s six depots overlap with depots operated by CTI. This continues CTI’s acquisition drive, after buying Jayde in October last year. The combined companies should be able to consolidate leases and build denser freight networks. In June print and tech services company CSG Limited (CSV) lowered expectations for this year’s revenue by 11% and halved earnings expectations. Enterprise sales to large clients didn’t materialise; the unit lost the company $6m and will be closed. Sales to small and medium businesses were also slow. The new technology business, providing non-printing hardware and software to businesses, missed expectations but still grew strongly, ending the year with 23,000 users. A new executive chairman will help with the turnaround. Management have given guidance for next year to recover substantially, but with a history of missing guidance this will need to be seen before credibility is restored. Finally, the last quarterly report highlighted a position in fund administrator Mainstream Group (MAI). Sticky customers, strong fund growth and growing margins all seem like a recipe for success, especially in a bullish market. The business has since announced healthy performance. In June, Mainstream reaffirmed its positive outlook with revenue expected to grow by 20-33% and earnings by 25-50% next year.